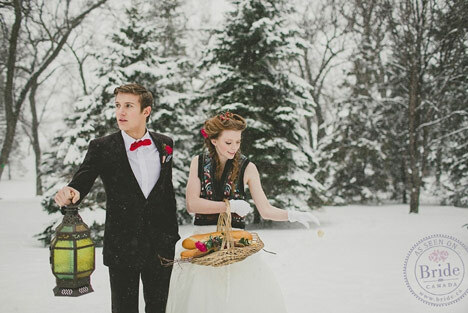 Melissa Johnstone of Sugar & Soul Photography brings us this sweet, fairy tale inspired winter styled photoshoot, set in Winnipeg, Manitoba. Loosely inspired by the Brothers Grimm tale of Hansel & Gretel, this editorial embodies all of the fun and festive possibilities of the holidays. 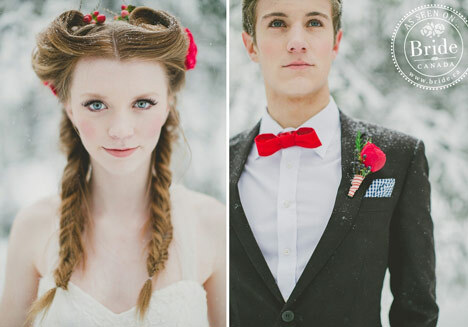 "Heidi and Markus embark on a journey to get married on a magical winter day in the forest. Leaving breadcrumb trails behind them, (in case they get lost! ), they discover a witches hut decorated in candy. 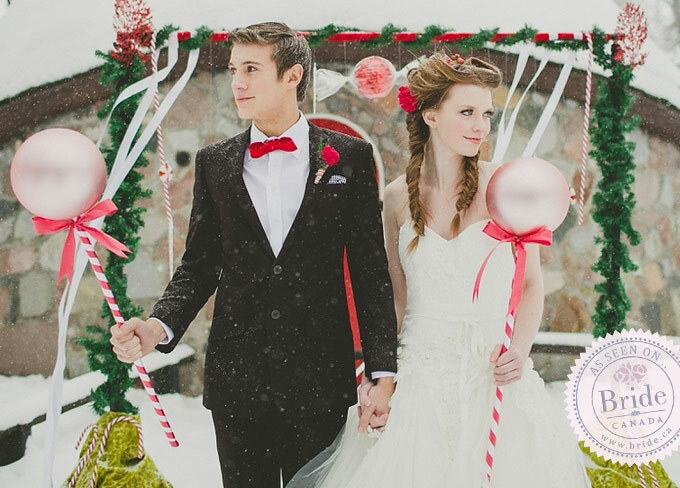 They say their vows amidst an archway of candy, then head into the hut for their whimsical reception - complete with snow globes, pretzels, and lots of holiday treats and warmth by the fire!" "As they walked through the trees, they left a trail of crumbs behind to mark the way." Photography by Sugar & Soul Photography. 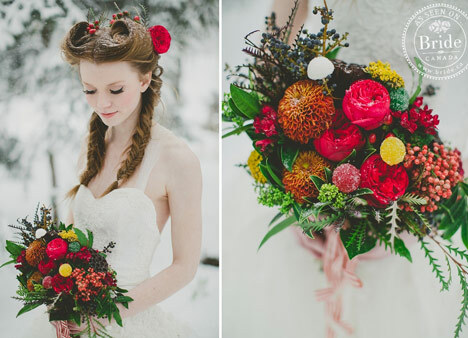 A beautiful, winter-inspired bouquet by Oak & Lily. The rich reds, oranges, and yellows stand out against the snow perfectly. This Hayley Paige wedding dress from Bliss Bridal Boutique is a pretty sea of tulle and lace. 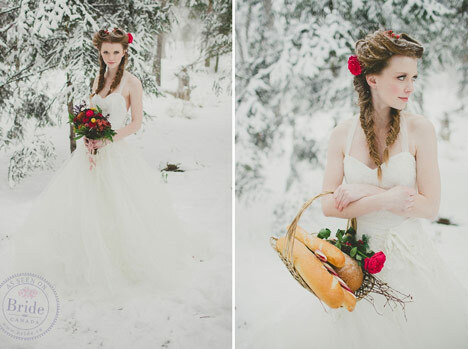 We love the soft and subtle glow that Justine of Vamp Industries Makeup & Hair created for the bride. 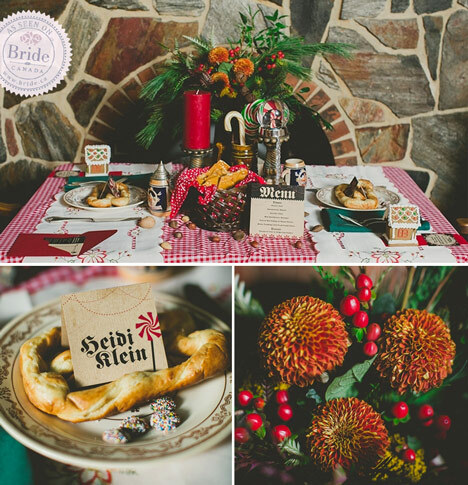 Nancy Arnold of Lady Owl Design did a fantastic job of infusing fun and festive elements into this styled shoot. 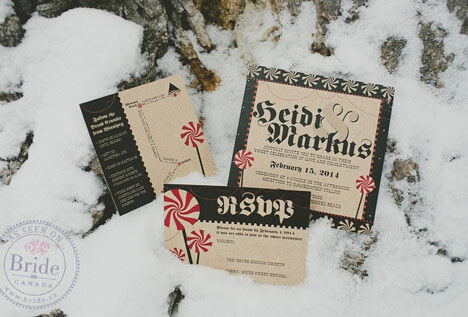 These striped candy graphics add the perfect touch of whimsy to this invitation suite by Lady Owl Design. The reception at Gasthaus Gutenberger was designed to envoke a nostalgia for German Christmas traditions of olde. 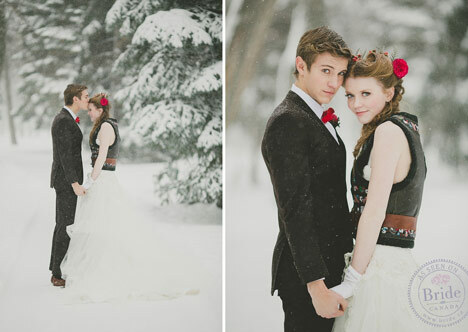 These two were the perfect pair to portray this sweet, snowy fairy tale, brought to life by Sugar & Soul Photography.